Well, we already know he can do the 'tache. 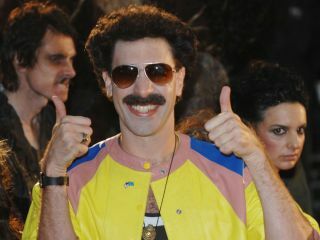 Sacha Baron Cohen is set to play Freddie Mercury in a new film about Queen, it has been confirmed. Speaking to the BBC's HARDtalk programme, Queen Guitarist Brian May said that the casting of the Ali G and Borat star "will probably be a shock to a lot of people, but he's been talking with us for a long time". The film will be scripted by Peter Morgan, whose previous credits include The Queen, Frost/Nixon and The Damned United. May and drummer Roger Taylor will oversee the soundtrack, which will include both Queen songs and Mercury's solo material. No title for the film has yet been confirmed, but it has been revealed that it will focus on the period leading up to Queen's career-defining performance at Live Aid in 1985. The big question, of course, is who will play the rest of the band? If you've got any suggestions, let us know.